Lord Mandelson has assumed control of the government for a week as the prime minister's summer holiday continues. The business secretary will be running the country until Chancellor Alistair Darling begins a stint on Sunday. 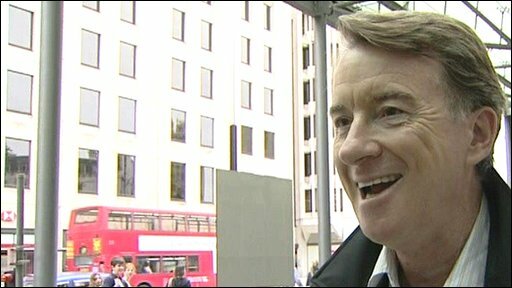 Lord Mandelson, who is returning from a break in Corfu, follows Labour deputy leader Harriet Harman in the role. As he returned to the UK he said it was "absolute nonsense" to say he was in charge, adding the PM "is in charge of the country and has been throughout". The prime minister is expected to leave his constituency of Kirkcaldy and Cowdenbeath for the Lake District this week, as he keeps up a record of always holidaying in the UK since assuming power two years ago. No one minister has officially been deputising for Mr Brown over the weekend after Ms Harman's foreign holiday overlapped with the business secretary's. It had been speculated that Lord Mandelson could be running government affairs by phone from Corfu. But a spokesman for the business secretary, who was recently promoted to first secretary of state, said it had been pre-agreed that he would be stand-in from his return until Sunday. The Downing Street spokesman said Lord Mandelson would be dividing his time between his offices in the Department for Business, Innovation and Skills, and the Cabinet Office. Lord Mandelson said after arriving back from Corfu: "It's been really good to go away and have nice peace and quiet on holiday. It was good and I am very glad to be back". But he added: "All this ridiculous song and dance about who is in charge is just a load of nonsense but he is on holiday and if there are small things I can pick up to give him the best holiday that he deserves, I'll certainly do that." He said he would be doing "bits and pieces" to help the prime minister. In recent weeks there has been some press speculation that Lord Mandelson could attempt to renounce his peerage and return to the House of Commons in a possible effort to become Labour leader. But in an interview with the Guardian newspaper, Lord Mandelson says he has become less overtly ambitious in recent years. He is quoted as saying: "I don't really see myself as a big beast. More as a kindly pussycat. "Yes, a kindly pussycat. I'm a kindly pussycat, with strong views about what we need to do." He added: "I think 10 years ago, and also 15 years ago, I was a very hard-nosed, uncompromising figure who was manning the barricades of change in the Labour Party, and prepared to take down anything or anyone who stood in the way. Asked about Mr Brown's holiday plans, a Downing Street spokesman said: "I am sure the prime minister will be engaged in a wide range of activities. "I am certainly not going to be drawn on what those might be." Meanwhile, protesters against the closure of the Vestas wind turbine factory in Newport, on the Isle of Wight, have chained themselves to Lord Mandelson's central London home. Members of the Climate Rush campaign group gathered in an "act of solidarity" for 625 workers set to lose their jobs.